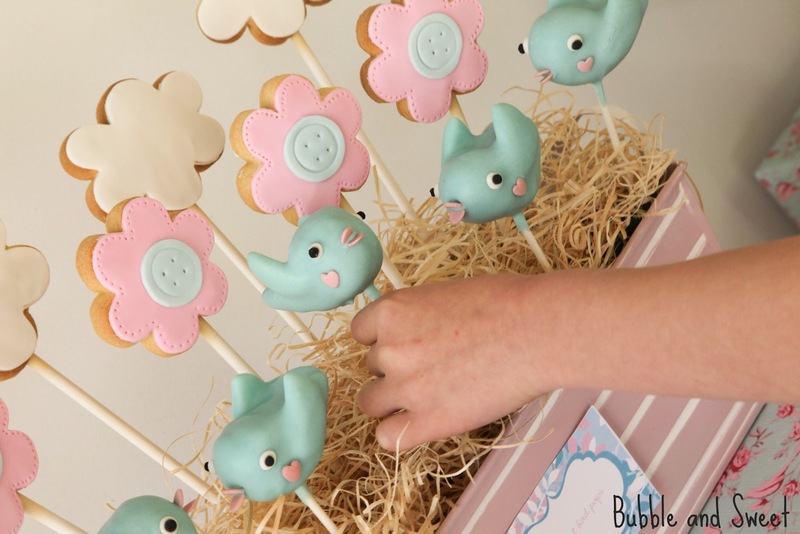 Here is a quick peek of some of the treats from Sophie's birthday party. Uh-huh super cute. They are actually a little display of yummy treats that I made using the recipes and instructions from Sweets on a Stick, just modified a little bit (tips at the bottom of the post). I know what your saying - what's with the peek? Can you just show the whole party for goodness sake? Well sadly, the day after Sophie's super fun party, she ended up in hospital for a few days, and then when she got out our 3 year old son....The Destroyer, ended up with a row of stitches on his head. Added onto that, Mr Sweet and I have also been flu-ish, and I have not really had a chance to sort out the photos and type up a post. Sorry all. And all the illness is probably why I am soooo cranky and about to have a huge whinge, which let's face it is generally not attractive and something I mostly avoid. 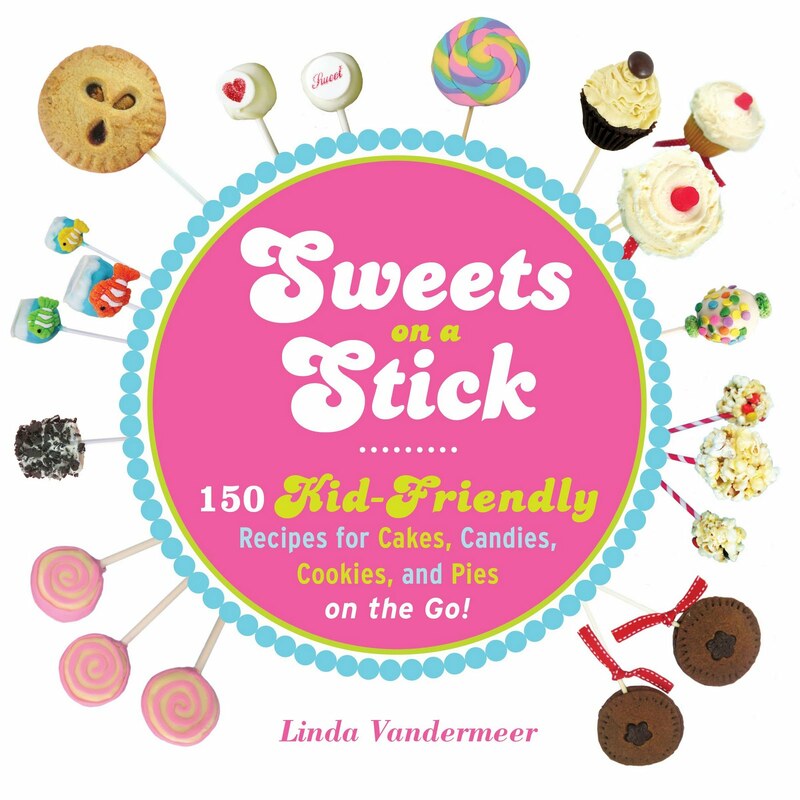 So apologies in advance, but here goes....a while back at the request of a publisher I wrote a book called Sweets on a Stick. Yes that's right the same book that I spruik non stop on this blog. Edit 31 August - OK there still seems to be some confusion. So before you read on Sweets on a Stick is still a color book. There was a very small print on demand in black and white which was an error...this problem has been fixed and all future copies WILL be color. If you do have a black and white copy you should request for it to be replaced.....ok back to the original post. Everything seemed ok and then a few months into this year I used an Amazon gift card I had for some stuff and I purchased 2 copies of my book. Still all good but then when they turned up they were black and white - yup, for Real. That is totally not how they were meant to be, it clearly states on the back cover of the book that the pictures should be color (plus I already had other copies from the publisher which I had seen and knew that it was wrong). When I emailed Amazon they offered to refund the money or send me another 2 copies, so I chose the 2 color copies, which solved my black and white problem pretty easily. Then I contacted the publisher to find out what was going on and they advised that Amazon has a process where they can print on demand themselves, so it seems what happened is Amazon (or maybe a company that works for them) printed the book in black and white and sent it out that way. You know mistakes happen, heavens know I'm not perfect by a long shot, so I was happy to let it all go. But I guess they didn't rush out to replace all the black and white copies that were printed and sent out in error. Because now there is a comment from someone who received one of those black and white books from Amazon on the Amazon website stating the book is black and white. And as it turns out people do read that stuff as I get quite a few comments from people asking whether it is really black and white. Sadly Amazon will not remove that comment, even though it is not a true reflection of the book, but rather their own faulty Print on Demand system. I sent them a polite email and when they said they would not remove the comment. I followed up as I thought as it was their (or a company that works for them) mistake, and as the book is not really black and white surely they would have to remove the comment? But no - they just told me the matter was no longer up for discussion and thanked me for my understanding. Yup - I am totally not understanding that. 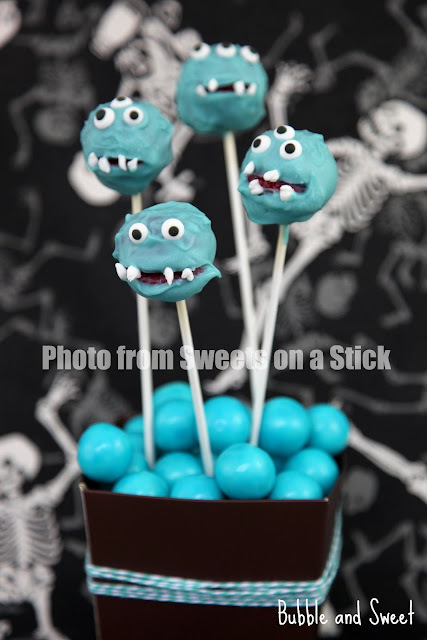 Anyhoo as there is not really that much I can do I'll just recap for y'all.....Sweets on a Stick does have Color pictures. If you have received a copy that is not color I suggest you contact whomever you bought it from (I'm guessing Amazon) and ask for a replacement. It has 50 color pictures which is around 1 picture for every 3 recipes, and yes I wish every recipe had a picture but a decision was made by the publishing team to print in the US instead of overseas and it had some impact on the number of pictures that could be used. 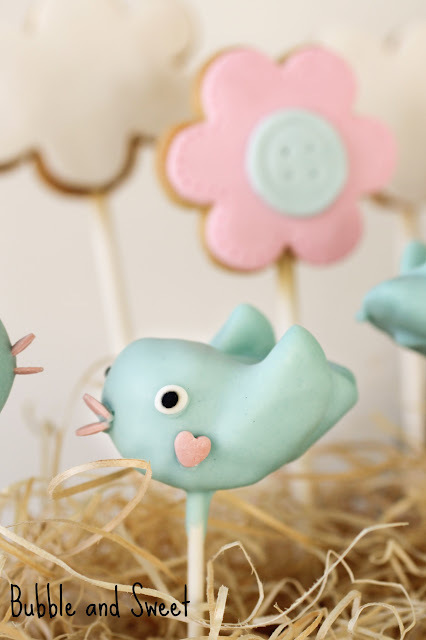 Sweets on a Stick is aimed at kids and getting kids in the kitchen and some of the recipes are pretty simple as a result. The recipes, although easy to make, taste good and I use lots of them on a regular basis myself. Sweets on a Stick is published in the US and uses ounces etc, but there is a conversion chart at the back to metric. Anyway Sweets on a Stick available at the Book Depository and Fishpond, you know I guess as well as some other big book stores that we no longer support here at Bubble and Sweet :) Doh I so don't have the time it's going take to go through the blog to swap all the links, but I'm doing it anyway. Fishpond: Sweets on a Stick: More Than 150 Kid-Friendly Recipes for Cakes, Candies, Cookies, and Pies on the Go! Bird Cake Pop modifications - To get a cute open beak follow the instructions in Sweets on a Stick and replace the beak with 2 extra heart sprinkles by attaching the curved top of the sprinkle to the bird before the candy coating has set. See picture for example of placement. I colored my own candy coating light blue using Flocoat and Wedgewood blue gel color (ratio 5 drops flocoat to 1 drop gel food color). 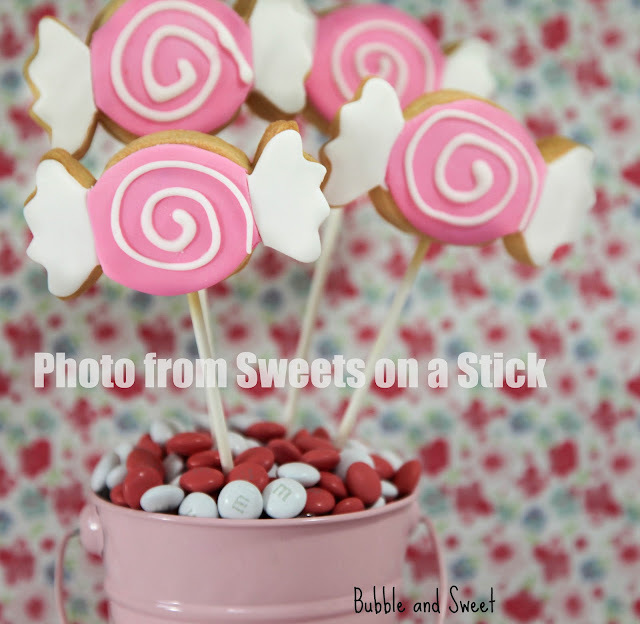 Flower Cookie Pop modification - the cookies in the above picture are made using a smaller blossom/ flower cookie cutter. Linda - thinking of you! You sound exhausted! I can't imagine why your beautiful book would be reprinted in black and white...crazy! Hang in there...those that know you and your amazing work won't be hassled by this little mix up. that is really shocking, and so strange they wont remove the copy. i bought your book from fishpond, no probs there. hope you whole family is better now and the birdies are so adorable. How disappointing for you Linda and frustrating. Luckily you've picked up the issue and are taking steps to resolve it. Great pictures there.. very cute! 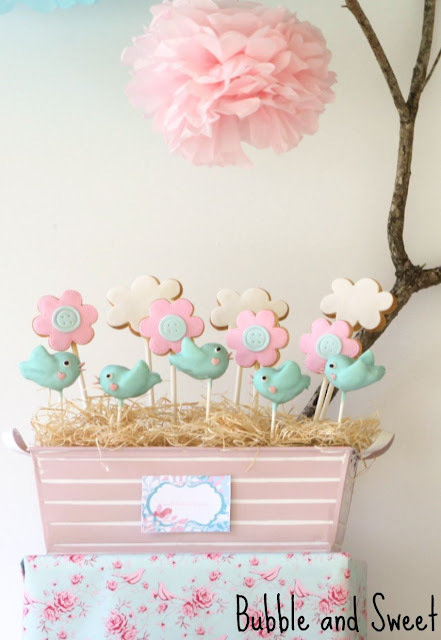 I am curious to read your book Sweets on stick. I wish you best in resolving any issues you are facing with your book. I love your work. 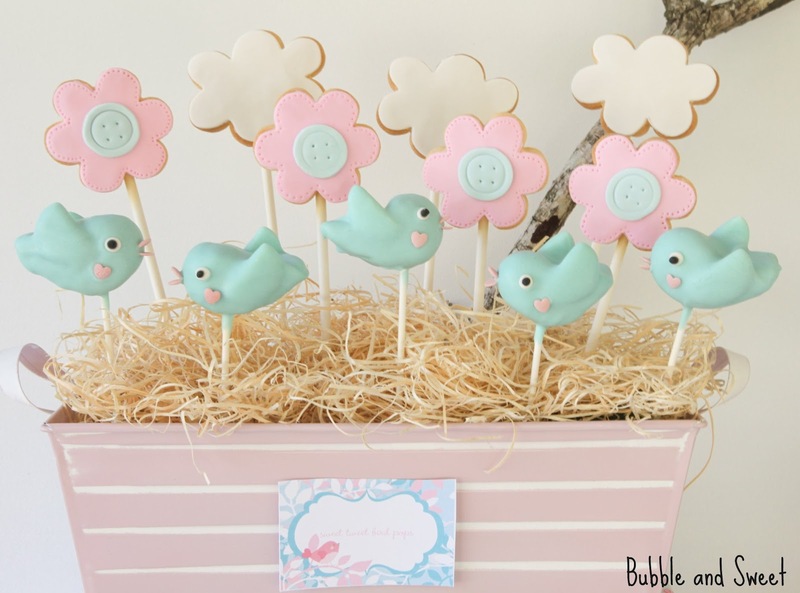 Amazing post for kids Sweets....i love this post.... thanks !!!!!! Hope everything is going better for you...health-wise and book-wise! Your cake and cookie pops are so pretty! Yummy, pretty fun! Bummer about the B&W books.